Chiropractic is a well known manual therapy to optimize health through the body’s inherent healing ability as affected by and integrated through the nervous system. The practice of chiropractic focuses on the relationship between structure (primarily the spinal column) and function (as coordinated by the nervous system) and how that relationship affects the preservation and restoration of health. 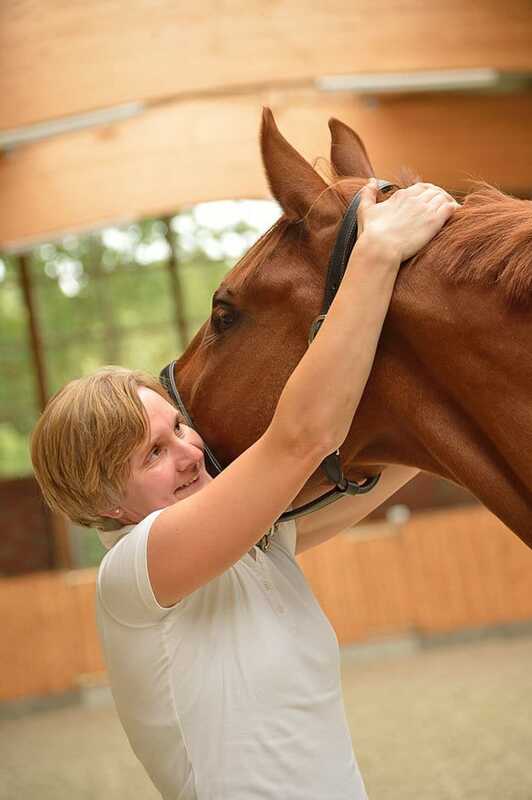 Chiropractic doesn`t replace traditional veterinary medicine but it is a reasonable addition in horses with back problems and may also help in the prevention of some mechanically related disorders. Many injuries start as mild or seemingly harmless conditions that after time develop into more serious problems. Other injuries are severe or life threatening and gradually improve but may never totally resolve; or they improve for a short time but later develop into debilitating arthritis or soft-tissue ﬁbrosis. Chiropractic care can help manage the muscular, articular, and osseous components of some of these injuries in performance horses. 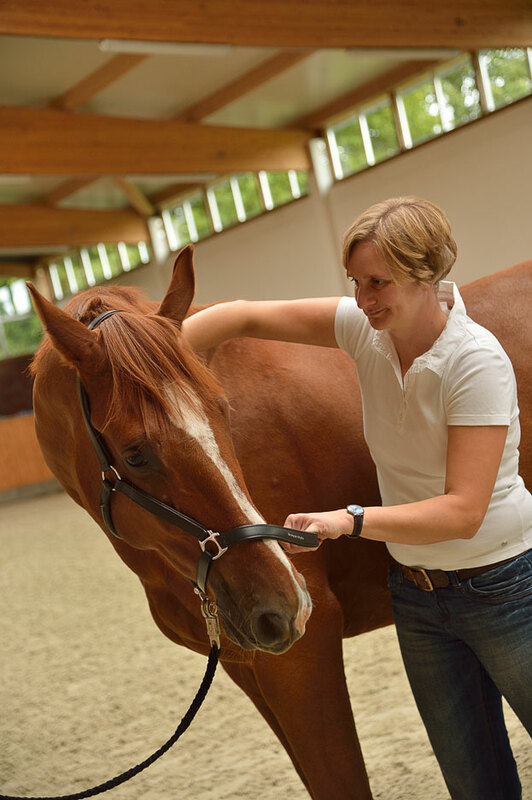 The purpose of chiropractic adjustments is to restore normal joint motion, stimulate neurologic reﬂexes, and to reduce pain and muscle hypertonicity to enable the horse to full performance. The vertebral subluxation complex is a theoretical model of spinal segmental dysfunction that incorporates the complex interaction of pathological changes in nervous, muscular, articular, ligamentous, vascular, and connective tissues. Chiropractic manipulation uses short lever, high velocity, low amplitude, controlled thrusts. During a successful adjustment, a release or movement of the restricted articulation is palpable. An audible cracking or popping sound may also be heard during adjustment, as the applied force overcomes the elastic barrier of joint resistance. 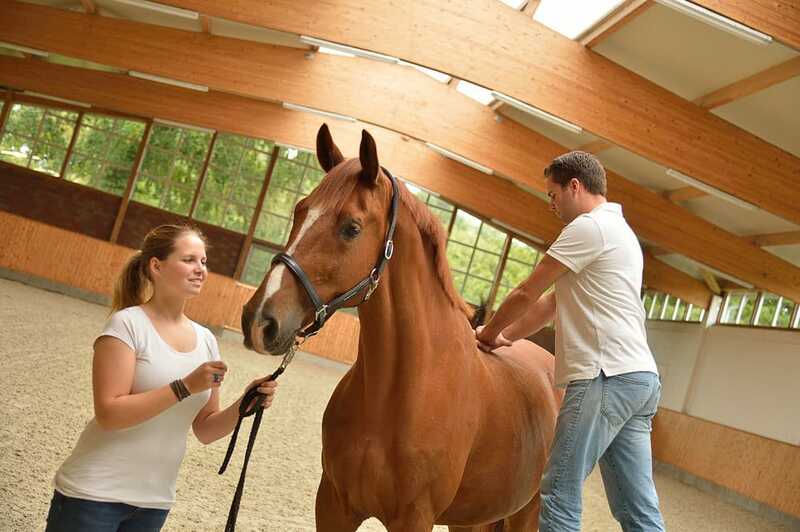 In individual cases muscle sourness after treatment can cause a temporary (maximum 48 hours) worsening of your horse`s mobility. In general, conditions with an acute onset respond rapidly to adjustments. The combination of manual and medical therapy might be additionally advantageous. Chronic conditions usually take long-term treatment or rehabilitation. Chiropractic is a conservative modality that may be applied repetitively over a set time period as the patient’s own recuperative abilities are used in the healing process to restore normal joint motion and neurologic function. Follow up treatments will be individually advised every 2-6 weeks.